Belkin has obviously tried very hard to make the Play Max an attractive package to beginners. The unit itself is neat – its three-dimensional aerials hidden within the stone-grey case. It's a plug-and-play affair in terms of getting hooked up. WPA2 is enabled by default, the relevant security details are written on a label attached to the base, and the unit's single button activates WPS to facilitate the quickest connections possible. It runs wireless N and G, and has twin radios to support 5GHz and 2.4GHz connections simultaneously. The power and range, particularly on wireless N, is fantastic. Giving guests access to your network is also straightforward. A hotspot-style connection technique enables visitors to connect to a 'guest' subnet, separate from your primary network, by typing a custom password into a browser landing page. If only Belkin had stopped at great connectivity instead of spooning more and more custard onto the router crumble. In the Play Max, Belkin has weighed down an otherwise fine router with a swathe of iPhone-style apps, most of which are flimsy masks for some pretty mundane, and in some cases poor, features. The Self Healing app, for example, appears to make the unit reset itself periodically to fix possible errors. Well, great. BitBoost claims to accelerate traffic based on its type – giving priority to gaming packets, for example – but we couldn't find any evidence that this was more than standard Quality of Service routing, something that comes as standard on the majority of new routers. Then there's Video Max HD: essentially the same thing as BitBoost, but for videos. It's not a complete bust; some of its functions are genuinely useful. Compatibility with USB printers and hard drives, for example, is a boon for the networking potential of the Play Max. But actually using that functionality means installing an awkward, dedicated, system-bloating application on your Mac and any other machine you want to connect. This is, frankly, a little ludicrous. We've used plenty of routers that work perfectly well with external drives and printers without having to resort to dedicated software. That list includes the Play Max's cousin, the Belkin N+, which makes this decision even more baffling when you think about it. Then there's the stuff that makes perfect sense but has been executed horribly. Take the Torrent Genie app. This basically amounts to on-board compatibility with the Vuze Offline Downloader, a shred of code that enables you to continue torrent downloads while your client machines are offline. Again, this is spoiled by unnecessary software; Vuze proper has an awful ad-laden interface, one so poor that we dropped it as a torrent tool of choice some time ago. If you want to use the Play Max take, you have no such choice. 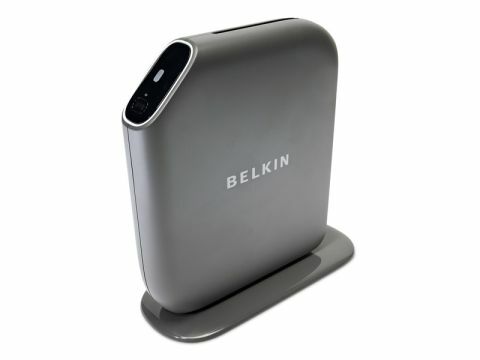 So here's the plan: instead of buying a Play Max router, buy its little brother, the Belkin Surf. It's less than half the price, doesn't include any of the tiresome, unnecessary features, and does the job of routing internet traffic around your network just as well. As for this offering, consign it to the 'marred by software' heap.